Use your iPhone's camera to turn textbooks from boring to easy to readContent summarization app Summize has released version 2.0 of its smartphone application, which brings along with it a host of new features and tools for condensing textbook content and news articles. Founded by 18-year-old Rami Ghanem, Summize got off to an incredible start when it was released two months ago, topping the App Store charts in numerous countries. Three teenagers conquered the App Store in 24 hours - here's howIf you had checked the App Store's top paid chart in the US on Sunday, March 27, you would have seen mostly familiar games like "Minecraft" and "HeadsUp!" 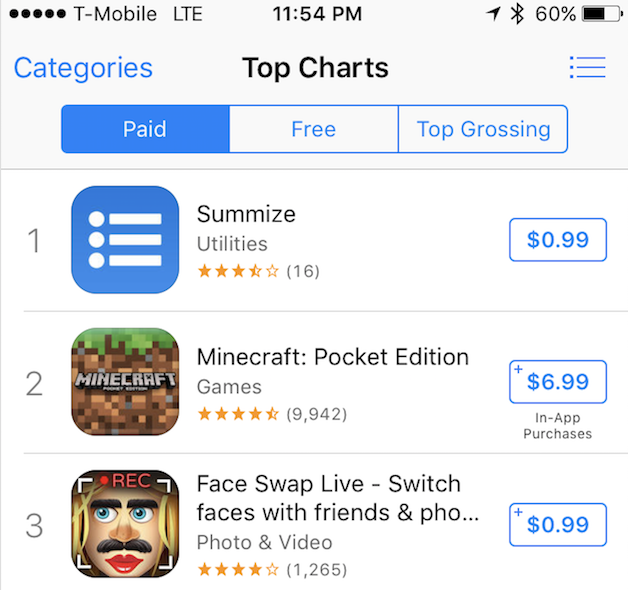 About 24 hours later, an unknown studying app called Summize had dethroned them all to take the coveted top spot. Would you recommend Summize to a friend? Thanks for the hunt - we're super appreciative! We launched Summize as a simple tool to help students get more from their textbook pages (and news articles). Our newest version introduces concept, keyword and bias analysis, along with a re-written summarizing algorithm. Some background - I'm 18 years old, have done some startup work before but this is my first serious project. I'm the Founder, and along with me on my team are Carter (18 years old) and Aiden (16 years old), both of whom ran the brains of the marketing campaign. 🙌🏻 We launched the new version about 23 hours ago and we are now the #1 top paid app in the USA (#5 in Canada, #7 in the UK). Lots of opportunity to continue building Summize, and maybe some new AI-based apps in the future. @rghanem1 Looks like an awesome concept. Do you have the Android version? @rghanem1 Impressive functionality and well worth buying. That said, this seems like something you may want to mention in the description... "This app will not work with religious texts, novels or poems. Please only use textbook pages and or news articles." ... simply to avoid the brief twinge of negativity it made me feel before actually trying it out. Huge congrats on the launch guys. So whens the Product Hunt AMA? Looks like an awesome concept! Wish I had this while I was in school... Would like to congratulate @rghanem1 (who it was fun to run into at SXSW) and the team on having the #1 paid app in the App Store right now!!! @nivo0o0 @rghanem1 yes i this is how i spotted it (actually when i posted it yesterday it was not #1 but i observed it was a fast raising one). Any insights on how that happened (and i guess this is not PH)? The latest updates seem to have taken this app to the next level, good luck guys. @maurice Thanks Mauricio! Appreciate it.